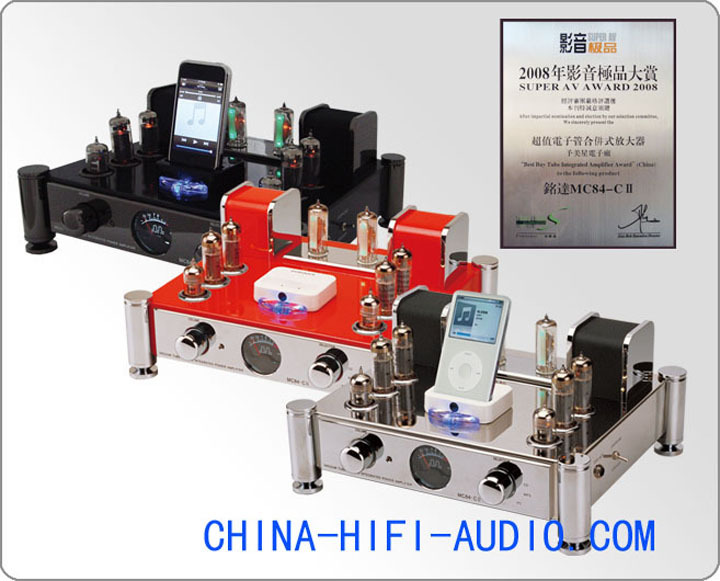 a)It can be connected to CD player and then you can enjoy the natural music played by the intergrated amplifier. b)It is convenient for you to insert your iphone,Ipod NANO or any other products of Apple Company to the machine by using the bracket we provide.Also,you can use other phones and MP3 to enjoy the songs you collect. c)You can move your songs in your computer to the machine by the USB socket in the back panel.Also,you can connect your earphone to the left socket of the machine and then enjoy the Hi-FI sound effect played by the pure electronic tube. d)By using the mini speaker MD007-1 designed for vacuum amplifier and input the audio signal of your television,you can feel like you are in the cinema. e)We provide a remote-control device made by aluminum alloy for the amplifier as well as USB data cable,wires for other MP3. f)The machine looks novel,fashional and scientific.The circuit inside is produced by hand-welded and we adopt electronic component of high quality.It is a amplifier of high cost performance,which can also come to user's convenience.